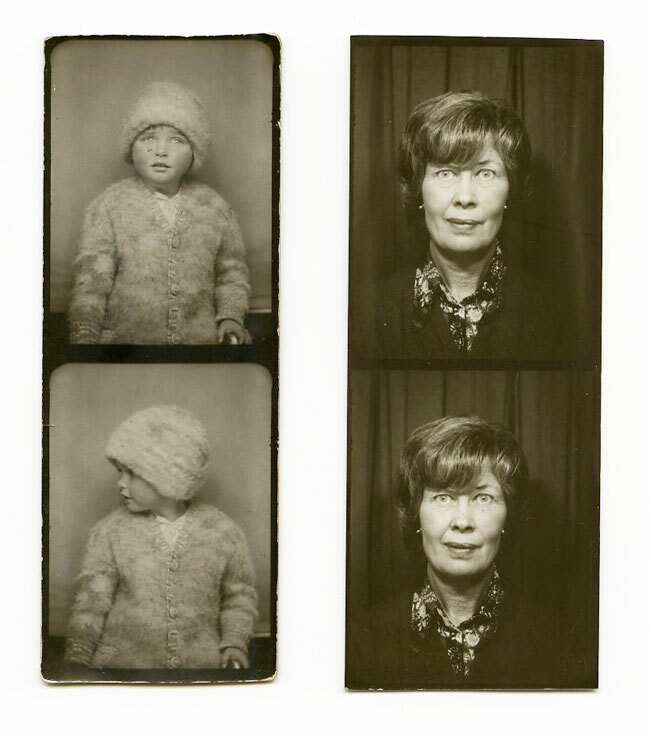 Occasionally amongst your family photos you may find a tiny photographic print or strip of prints from a photo booth. Wikipedia describes a photo booth as a vending machine or modern kiosk that contains an automated, usually coin-operated, camera and film processor. 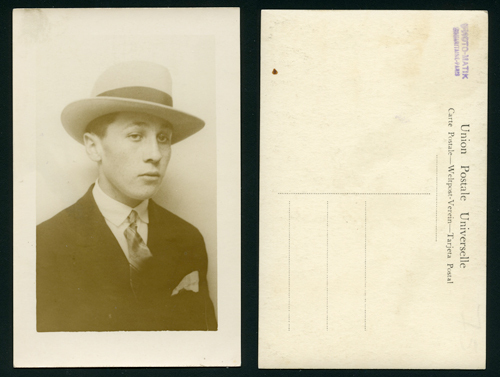 This page discusses the development of the photo booth and gives pointers to dating these small portraits. The photo booth has a long history, is ubiquitous today in the UK, being a useful device for correctly formatted photographs for passports, driving licenses, firearm certificates and other identity documents. In addition the photo booth, in its digital format, is enjoying something of a resurgence at the present time as an added amusement at weddings, parties and other events. Since its arrival, the photo booth has proved to be popular – not just for the practical purpose of obtaining an affordable self portrait, but, because the customer is the operator of the machine, for the entertainment value of pulling strange faces at the camera, cramming in with your partner or friends for group shots, and for some even the excitement of stripping off clothing for a more risque image, taken in the dubious privacy of a tiny space behind a flimsy curtain. The first patent for an automated photography machine was filed in the USA in 1888 by William Pope and Edward Poole of Baltimore. Other patents and apparatus followed over the next few years but early equipment lacked reliability and required assistance from a human operator. 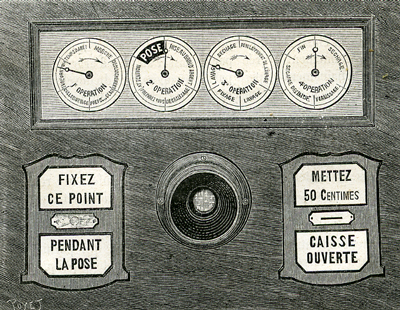 These pictures from La Nature 1889 show a French automatic machine invented by Theophile Ernest Enjalbert, which was operated with the help of an attendant. The machine was described in Enjalbert's patent application as "Apparatus for receiving coin and for producing and delivering photographs in exchange therefor"
Daily Telegraph & Courier (London) - Thursday 08 May 1890, p3 and numerous other papers reported: "Revolution in photography. A photograph delivered automatically in 45 seconds in exchange for a penny. The press of the kingdom declare the invention marvellous. Bristol Times and Mirror - There will certainly be a rush for the automatic photographer. 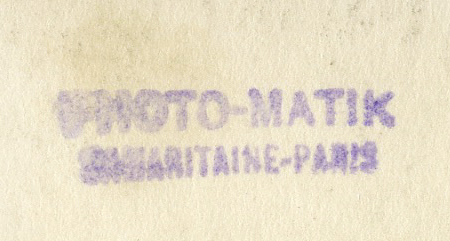 Automatic photograph Company Ltd. Truth. I am told that before long we shall have the automatic photographic camera on the streets and in the railway stations. A friend who inspected the machine at Messrs Salters, West Bromwich, the other day informs me that the likeness is taken within three seconds of dropping the proverbial penny into the slot and that the complete picture is delivered in about 30 seconds. In point of speed, at any rate, this beats Mr Weller’s “profeel machine". Prospectuses will be ready on Saturday next". The Leeds Mercury, Saturday 10 May 1890. p6. reported that a prospectus had been issued for the Automatic Photograph Co Ltd to raise £100,000 capital by issuing 19900 ordinary shares at £5 each and 500 founders shares at £1. The company would be purchasing a machine developed by Mr Isaac Joel, patent no 11,354 of 1889. 1d in slot, complete print in 45 secs, another slot for a half penny and you get a suitable frame. The Scotsman - Monday 19 May 1890 p1- announced the launch of the Automatic Photograph (Foreign and Colonial) Co Ltd, reg office 5 Copthall Buildings London EC to promote the invention overseas. Various reviews of the apparatus were cited. A demonstration had taken place at Salter and Co, spring balance manufacturers at West Bromwich. Prospectus followed. The cost of materials was reported to be half a penny to produce a penny photo. Frames were 1/2d per gross. £200,000 per country was being asked for patent rights. Advertisements stated that the capital of the company would be returned to shareholders several times over in dividends in the course of the first year. The firm had already received interest in patents for France, Belgium, Italy. By September / October 1891 both companies were being wound up. There were problems with the supply of consumables. There had also been irregularities, with under-subscribed shares being allocated to fictitious investors and the company apparently having an imperfect title to the claimed patent rights. The Bosco from the German company’s advertising. This was an early commercially successful automatic photographic apparatus invented by Conrad Bernitt of Hamburg (Patented in the US in 1890). 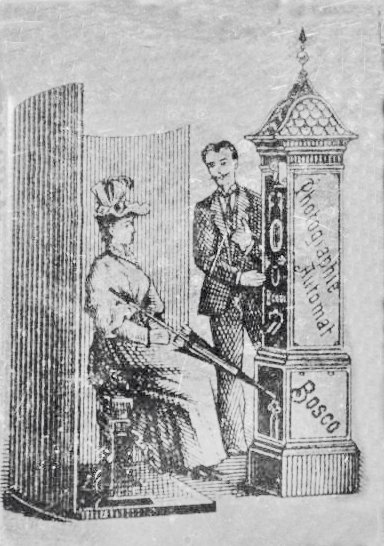 A semi automatic machine, the Photautographe, by M Ferrer from Barcelona, illustrated and reported upon by La Nature in 1895. These early machines produced tintypes. The first machine to use a negative and positive process was invented by the German, Carl Sasse, in 1896. What we would now recognise as a photo booth was developed by Anatol Josepho, a Russian immigrant in the USA, His first photo booth appeared in 1925 on Broadway in New York City. For 25 cents, the booth took, developed and printed 8 photos, a process taking roughly ten minutes. In the first six months after the first booth was erected, it was used by 280,000 people. The Photomaton Company was created to distribute these booths nationwide in the US. In 1927 Josepho was paid one million US dollars, plus future royalties, by the company for his invention. Shares in the UK company soared on the back of the publicity the company was getting. In June 1928 a Far Eastern Photomaton company was formed to market booths across China. India, Japan. Egypt, Ceylon and Malaya. The share issue was 10 times over subscribed (Leeds Mercury 15 June 1928 p 2) Later other Photomaton companies were formed for the continent, Eastern and Central Britain and for Lancashire and the Midlands. Investors were keen to take up shares in a company with a product which embodied an exciting and profitable future. In June 1928 the Daily Mirror announced a £100 competition “BOREDOM, GRIEF, SURPRISE, PLEASURE, can all be expressed in your face - try on a photomaton strip and enter for summer photomaton expression competition"
In Nov 1928 Schofields of Leeds were advertising “Send your friends an enlarged photomaton photograph for Christmas”. Postcards 3 for 1/9d, Cabinet 3 for 5/6 and Boudoir 3 for 10/6d”. The original 8 portraits in 8 positions were 1/-. On 3rd Dec 1929 the Yorkshire Post carried an extensive Photomaton Directors’ report which stated that machines would shortly be installed in the UK at around 50 per month, arrangements had been made for the installation of Photomaton machines at all the principal branches of Boots and Photomaton lorries with mobile machines would shortly be touring to places not already blessed with booths. The Directors further concluded that there were no other machines in the market which were offering a serious challenge to them. Further advertisements from various stores appeared in the press in 1928 and 1929 highlighting the delights of 8 portraits for a shilling – the example below is from the Dundee Courier and Advertiser 30th March 1929. The next advertisement is from Britannia and Eve’s June 1929 edition. By July 1929 the Photomaton parent company was located at Brixton Rd London SW9. In July 1929 it was announced that the Photomaton Lancs and Midlands company was to be wound up. The Western Morning News on 8th August 1929 further reported: “New Photomaton Company. A new company to be called the British Photomaton Trading Company, Limited, is to be formed to take over the distributing side of the Photomaton (Lancashire and Midland), Eastern and Central Companies, in conjunction with the parent Corporation. Shares in the existing company were to be exchanged for shares in the new company at a preferential rate. There was no clear explanation given for this complex financial re-organisation in which everyone seemed to be a winner. On 18th September there were severe falls in the price of Photomaton shares, fuelled by adverse rumours and late reporting by the Board. On 20th September dealings in Photomaton shares were suspended on the London Stock Market. In what was described as the “Greatest City sensation for years”, Directors appeared before the Guildhall Magistrates charged with conspiracy to defraud. It then transpired that the booths had not been as popular as hoped and that Clarence Charles Hatry (1888-1965), the entrepreneur who headed the company, had been using money from his other companies to prop it up, until finally he ran out of money and started to issue fraudulent instruments to cover the losses. Hatry was sentenced to 14 years imprisonment (serving nine). As a result of the Hatry fraud some £145 million was allegedly lost by investors and the crisis fed into the Wall Street Crash which began the next month. By 16th October 1929 the winding up of the Lancs and Midlands company had been halted and shareholders instructed that the business should continue to operate until auditors of the parent company reported on the move to the proposed Photomaton Trading Co.
By the 12th November 1929 a new Board was in place at the Photomaton parent company chaired by the Marquis of Winchester. In January 1930 the new Board produced company accounts for the period 1928-1929 showing a £97,000 operating loss and assets worth £2m less than previously claimed – the remaining assets claimed were mainly in the form of intellectual property and shares in subsidiary companies, which the firm’s accountants were quick to state had not been valued by them. At the firm’s annual meeting one of the Directors remarked that the company had hitherto been run more for selling shares than photographs. In January 1930 the change from the Lancashire and Midlands Photomaton Company to the new Photomaton Trading Co went ahead. In April 1931 shareholders voted to wind up the new Photomaton Trading Co. (The Gazette 17 April 1931 p2514) The American company was also liquidated, but the UK parent company limped on, with a trading loss of £10,000 in their 1932 annual report. By 1938 the original Parent company had been dissolved (The Gazette 7 Jan 1938 p115) As a result of the Photomaton problem the Stock Exchange Committee passed rules prohibiting the public flotation of the shares of any company formed to exploit a new patent until the company had published its first year’s profits. But the Photomaton booth lived on. By 1938 the British Automatic Company Limited had taken on the distribution of the Photomaton booths which were by this time made in the USA by the International Mutoscope Reel Co Inc in New York City. The British Automatic Company had a long and interesting history. It was founded in 1887 and over the years had installed and run vending machines, weighing machines and amusement machines across Britain, in particular at railway stations. At the same time that Hatry was developing the Photomaton parent company, another of his companies, the Associated Automatic Machine Corporation Ltd, set about buying up a number of other vending machine companies and bought up over 90% of the shares in the British Automatic Co. No doubt because the British Automatic held many valuable site licenses, Hatry’s company continued to trade in the British Automatic name. The Hatry collapse financially damaged this business also, but it managed to survive and continued in being until the 1960s. In the USA the International Mutoscope Reel Co, then owned by William Rabkin, continued to make improvements to develop the Photomaton and re-named it the Mutoscope Photomatic, later the Delux Photomat. At this point the machine produced a strip of four images, a format with which we are familiar today. 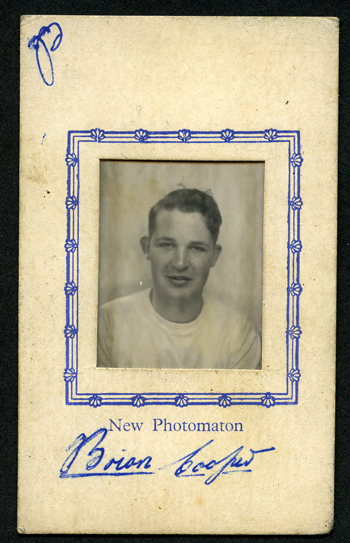 It could be that at this point the UK distributors of the Photomaton booth started to use the phrase "New Photomaton", as shown in the mount of the example Photomaton image below. 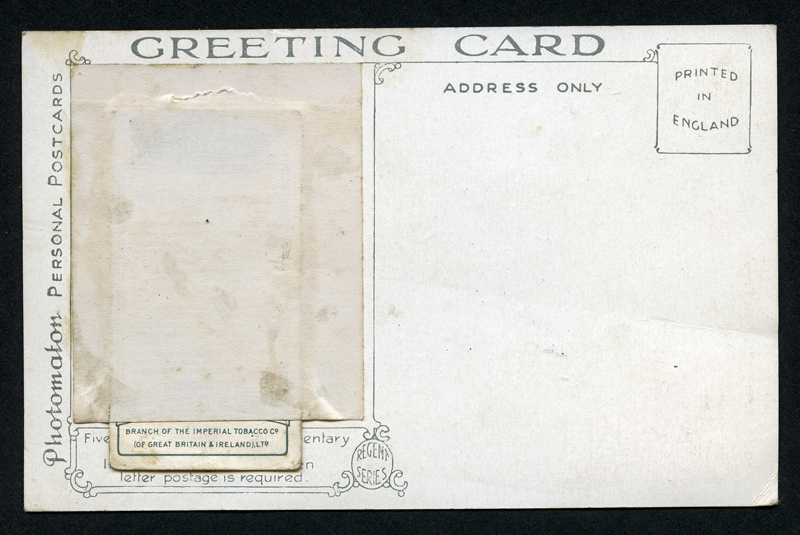 The image here is 2¼ x 1½ in with black border with rounded internal corners. Photomaton produced postcards into which your portrait could be stuck. Below is an example where someone has inserted a Players cigarette card into the oval space provided for the portrait. 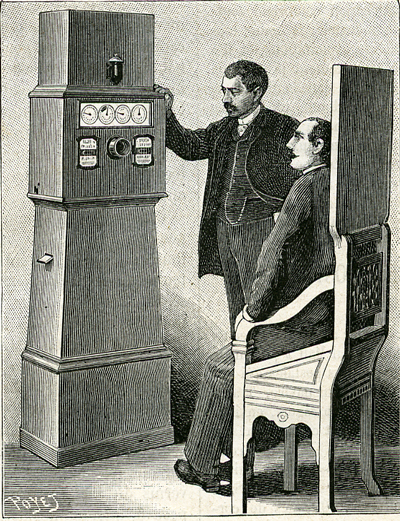 The great initial interest in the Photomaton machine spurred on other inventors and manufacturers in the UK. The Sheffield Daily Telegraph on Friday 28 September 1928 gave news of a new photo booth under the headline "SELF-PHOTOGRAPHY. Efficiency of New Automatic Machine". "Is there any limit to human ingenuity? It seems only a few months ago (writes a correspondent) since I attended a demonstration of a shilling in the slot automatic machine that presented each user with eight excellent little photographs of himself in the space of eight minutes. It was an American invention, quite new to this country at that time. Since then two other rather similar machines have made their appearance on the market, each claiming to be an improvement on its predecessor, and there was a Press demonstration yesterday of a further venture in automatic photography, which appears on the face of it to be a distinct advance on anything that has gone before. It rejoices in the name of the "Photo-Matik", and is a joint invention of Mr. J. I. Stealey, the photographic genius, who originated” sticky-back photos thirty years ago, and Mr. Stanley Hart. It is semiautomatic only, and is described as "100 per cent. British.” The sitter enters a cabinet, inserts sixpence in a slot, and having achieved a satisfactory pose before the camera, presses a button which makes the exposure. A fresh pose and a further exposure follow, and then a third before the sitter leaves the cabinet. 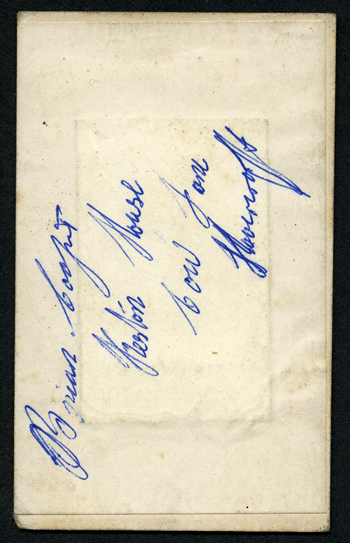 Seven or eight minutes later he or she receives a strip of three full postcard size portraits of considerable artistic merit and as, unlike most “automatic” photographs, they are taken on a negative, an unlimited number of prints can be obtained at short notice. The company running Photo-Matik proposes to open various centres and to fit out a number of cabinets mounted on a motor chassis which will tour fairs, shows, and pleasure resorts in various parts of the country. If the enthusiasm of the Pressmen present can taken as a guide, the new machine should prove to be extremely popular." Photo-Matik's head office was 9-11 Harrow Road, Edgware Road, London, W2. Stanley Hart, of Cornwall Gardens, Brighton and James Isaac Stealey of 2 West Street Mansions, Brighton, the joint inventors, both received £5k in cash and 100,000 shares each in the new company, Photo-Matik portraits Ltd. The joint inventors were retained for 2 years as technical advisers. The Leeds Mercury on Tuesday 30 October 1928 p.3 reported that Woolworths were trialling the Photo-Matik and would be taking on more machines than originally planned. Accordingly Photo-Matik shares would be giving a higher yield than expected. There was apparently some sort of dispute over intellectual property between Photo-Matik and another set of inventors with another machine. The Scotsman reported on 5 Nov 1928 p3 that another prospectus had been issued for a company called Auto Portraits Ltd, offering the issue of 1,000 shares of 2/- each to raise overall share capital of £130,000. The auto portrait was described as semi automatic photographic apparatus enclosed in a specially designed cabinet. It delivered perfect portraits from negatives within 9 minutes. Each portrait was a different pose. The machine produced negatives printed on paper. Negatives could be purchased by the sitter. Portraits were passport sized and cost sixpence for six. The apparatus was to be available to rent for £1 per week. The apparatus was described as "foolproof" and could be operated by unskilled operators. It was reported that the Auto Portraits inventors, Joseph Edward Bramwell and William Smith, had entered into a covenant with Photo-Matik not to oppose each others processes. Photo-Matik were to produce post card or larger prints. The predicted annual trading profit for Auto Portraits Ltd was £77,000. The Birmingham Daily Gazette Tuesday 11 December 1928 p9 reported on the first annual meeting of Auto Portraits Ltd. "AUTO-PORTRAITS Ltd, "SIX FOR 6D" Well considered Organisation. The statutory meeting of Auto Portraits, Ltd., was held yesterday at Winchester House, London, E.C. Mr. E. S. Shrapnel-Smith, C.B.E., F.C.S. who presided said: The meeting had been called at an early date in order that the directors might meet the shareholders. When the company receives the further payment in respect of foreign rights it will have the capital available for further trading developments as estimated in the prospectus. After one month of trading we had nine machines working, including those at Messrs. Holdrons, of Peckham, branches of John Thrifty. Ltd., one each at Reading and Newport (Mon. ), and two at Glasgow. Within the next four weeks the number will be trebled. This is a good start. " Auto-Portraits" offer two irresistible advantages: positive photographs like those posed for in a studio, and six of them for 6d. On a recent Saturday 350 sitters patronised a single cabinet. " Auto- Portraits" need only 15 seconds per sitting, and in 10 minutes six beautiful permanent photograph, are delivered. At a moderate extra cost an enlargement, artistically mounted, can be made in 15 minutes. Whoever installs "Auto- Portraits " holds the field in automatic portraiture in his district. It places all opposition enterprises out of the running. The cabinet occupies very little space and it can make a hitherto unproductive corner of an establishment, show rooms, or other premises, furnish a handsome profit to the hirer. No skill is required. Junior assistants of average intelligence quickly make adequate operators. There is no outlay on films or plates. The company is prepared to give terms to clients to suit their individual preferences. A hire system at an average rental of only £1 per week promises to be the most popular. Cordial invitation is extended to all who are interested to write to the company et 25-27 Charles Street, Haymarket SW1. The company's manufacturing arrangements are complete. Rapid delivery can be given. Supplies and accessories of all descriptions, including frames and mounts are in stock. The business in hand is most promising. The practical manner in which our staff are handling inquiries has already met with the highest approval. We can guarantee prompt attention and reliable service. No customer is prejudiced for fire assurance purposes by the adoption of the “Auto Portraits” system." Another company, Photo-Matik Foreign Corporation Ltd., was floated to sell the Photo-Matik design in other countries. Photo-Matik was quickly advertising for staff as shown in this advertisement from the Yorkshire Post Wed 21 Nov 1928 p2: "PHOTOGRAPHY— Vacancies in Leeds for Female Dark Room Assistants; some previous photographic experience essential; one week’s London training is paid, 35s. also accommodation found and fare paid both ways; suitable applicants, after training. offered post with wage £2 and bonus per week.—Apply immediately, Photographic Department. Photo-Matik Portraits, Ltd., 9-11, Harrow Raid. London, W. 2. C"
All appeared rosy at first for Photo-Matik. The Western Daily Press reported on the company's Annual Meeting on Friday 11 January 1929, p10, when the Chair reported some of the installed machines already exceeding their projected profit figures and that machines were in place in London, Liverpool, Leeds, Manchester, Bradford, Cardiff, Newport, Bristol, Plymouth and Dublin. The Daily Herald reported on Monday 18 February 1929 p7. "PHOTO-MATIK Photo-Matik Foreign Corporation, Ltd., announces that, contracts having been concluded with financial groups in Hungary and Italy, a first supply of Photo-Matik machines is now being dispatched to these two countries. The company is exhibiting a machine at the Leipzig Fair in March, and at the Brussels Fair in April." Grace's Guide to British Industrial History lists Photo-Matik as attending the British Industries Fair at The White City, Shepherd's Bush, London W12, from 18 February to 1 March, 1929. They had an advertisement in the Fair's catalogue. https://www.gracesguide.co.uk/Photo-Matik_Portraits. The advertisement showed the companies behind the product were: Photo-Matik Portraits Ltd and Photo-Matik Foreign Corporation Ltd.
Then, The Scotsman announced on Wed 1 May 1929: "PHOTO COMPANIES COMBINE. The directors of Photo Matik Portraits ( Ltd. ) , Photo Matik Foreign Corporation ( Ltd . ) , and Auto Portraits ( Ltd . ) announce that they have concluded negotiations for an amalgamation of the three companies . Circulars will be issued later this week to the respective shareholders, setting out the terms of. the amalgamation , together with notices convening extraordinary meetings for the purpose of ratifying the contracts which have been entered into." The Nottingham Journal added on 6 May 1929 that Auto Portraits would be acquiring the shares in the other two companies. Amalgamation would result in considerable economies. Auto portraits were increasing their capital by the creation of 1,500,000 2s shares of which 800,000 will go to shareholders of the other two companies. But, all was not well. The Scotsman - on Thursday 16 January 1930, P3, reported: " Shareholders of Photo-Matik Portraits ( Ltd) had to listen to a sorry tale regarding the early history of their company at to-day's annual meeting . The arrangement the Company had with Woolworths for the installation of its machines in the depots of that concern proved by no means the profitable proposition which had been anticipated . In fact, by February 1929 Messrs Woolworth intimated that the Company would have to withdraw its machines from all branches except those at Edgware Road and Oxford Street. Apparently the space taken by the installation together with the crowd caused, which interfered with business at adjoining counters was resulting in a loss per square foot of counter space to Woolworths. Rights in certain companies were sold to the Photo-Matik Foreign Corporation but apart from this, efforts to sell rights in other countries, including America and Canada, were unprofitable. Actual costs of production, distribution and servicing were considerably higher than original estimates. It was frankly admitted at the meeting that, should the company liquidate now, it was most unlikely that there would be anything for shareholders. Apparently however there is some slight hope for the future. The whole of the original board has now left the Company, the last of these gentlemen, Mr Alban Gordon, being refused re-election today. The new Board, it was stated, has halved the overhead expenses in the past six months and there was a small trading profit in the period. Apart from the automatic machine, business hopes were held out of the profitable exploitation of a new paper film for use in ordinary cameras, though it is difficult to see where the finance for this is to come from. There is at present, it was stated, about £2000 in the bank." By January 1931 a Bankruptcy notice had been issued against James Isaac Stealey (The London Gazette 27 February 1931 Issue: 33693 Page: 1397) The London Gazette: 1 December 1931, Issue: 33776 Page: 7783 reported that meetings with creditors had been ordered for Photo-Matik Portraits Ltd, Auto Portraits Ltd and the Automatic and General Photographic Co, another firm with the same address. The London Gazette 12 September 1933 Issue: 33977 Page:6007 reported the winding up of three Cos all with address of 90 Cannon St :Photo-Matik Portraits Ltd, Automatic and General Photographic Co and Auto-portraits Ltd.
Below is a portrait of an unknown man in a hat on a postcard which bears a small "photo-matik Paris" stamp on the reverse. 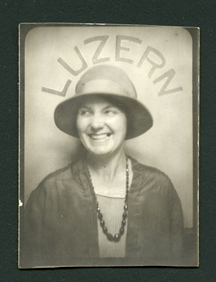 Was this an example postcard portrait from an experimental Photo-Matik machine? Nothing has been found in press reports suggesting the firm had a machine in operation in Paris, and the rubber stamp seems rather small and discreet for a company desperate to get a market share. On the other hand the image part of the postcard is unusually small for a postcard portrait. A legal case at Blackpool brought under the Blackpool Improvement Act 1902 involved automatic machines placed in pairs on three sites on the forecourt of Blackpool Promenade – described as machines which take one photograph and give one’s weight and the current date. The machines had been in place from 1934 to 1938 (Lancashire Evening Post, Friday 19 August 1938). In the 1940s in the USA photo booth machines were developed by another company, the Auto Photo Co who rented out, rather than sold, their machines, thus quickly gaining market share from the photomaton booths. The Photomaton name lived on in France as is shown by the 1980s advertising leaflet below by Ted Benoit, This is a two sided, folded, A4 leaflet. In 1954 Photo-me Ltd was registered as a company in the UK to produce and market photo booths. This company is still in existence today and is the world’s leading operator of photobooths and a major supplier of other instant vending equipment. Photo-me has around 27,000 photo booths in place globally. Photo-Me is a British plc company and has been quoted on the London Stock Exchange since 1962. In 1982 Photo-me bought up Photomaton and Photoquick with their international operations. 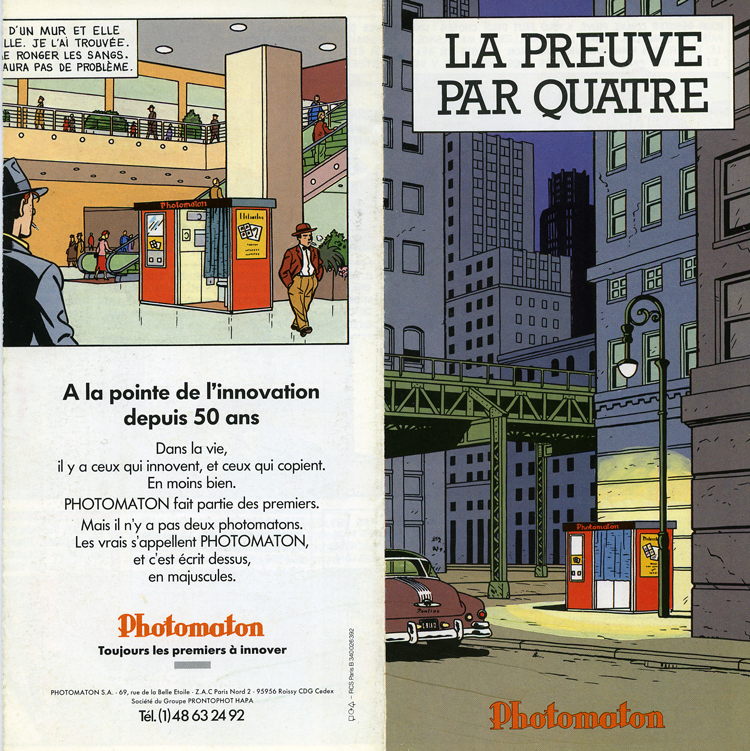 In 1998 they acquired Prontophot and Photomaton France. Photo-me has developed a range of different machines over the years, including a classic version by designer Philip Stark. Today over 8 million customers per year use Photo-me photobooths in the UK. 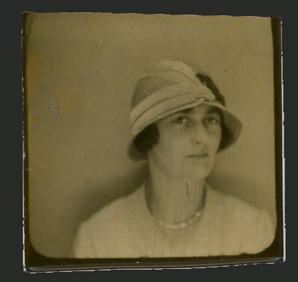 Surviving photo booth prints- can we date them? The following pointers may help to date small portraits from photobooths and related sources. Photomatic, 1928 - 1950s On older machines a strip of 8 images, the size of each image: 1 3⁄8 x 1 7⁄8 in, each image has rounded masked corners. Black edging to individual images. Where strips survive uncut photos are joined vertically, i.e. top to bottom. Stickybacks - 1901 - 1919 - there is more on these on our pages on StickyBacks. The early "stamp photographs" 1901 - were 1¼ inch square - those of taller subjects could be up to 2½ in tall. They had lickable gum on the reverse. Uncut strips might contain 4-6 images. Where strips survive individual images are joined horizontally, i.e. side to side. 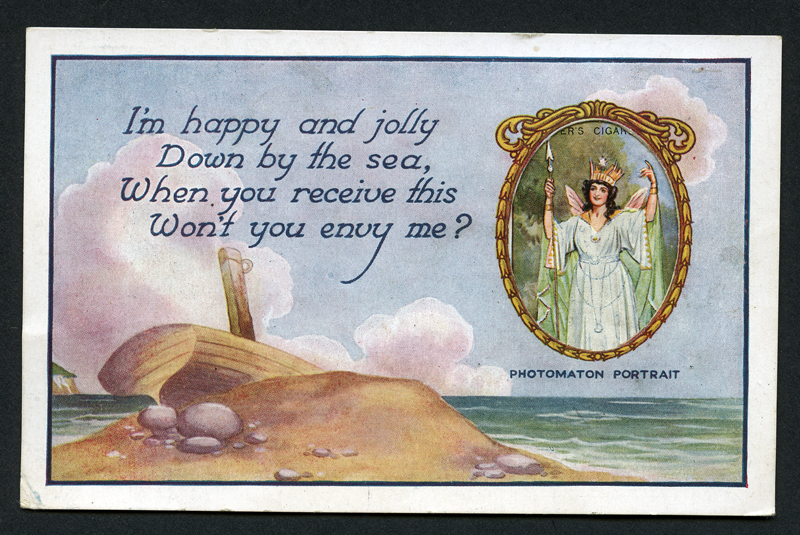 Larger photographs and postcards produced seem to have been framed with too much background in the top of the image, and they often contain numerals just visible inside the edge of the image as a permanent record of the job / image number. These may have been provided as proofs with a better framed image as the final product. The subjects of these portraits are usually from the less well off. Polyphoto - 1933 - 1969 An image system producing proof sheets with 48 images, 6 wide x 8 tall, each image 30mm x 30mm with white borders. Often found in old albums as multiples, not necessarily in strips. There is more on Polyphoto on our main listing of photographers. These examples are pairs of images from photobooths. 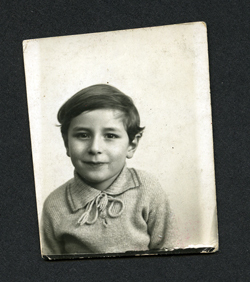 The prints on the left of a child in knitted cardigan and hat are on paper 37mm wide. The make of the photobooth is unknown. The example on the right of an unknown lady may be from the 1970s, on paper stock 40mm wide. The reverse of the paper is branded P.M.I. indicating that it has come from a Photo-Me International booth. Photo booth resources on the net http://www.photobooth.net/.